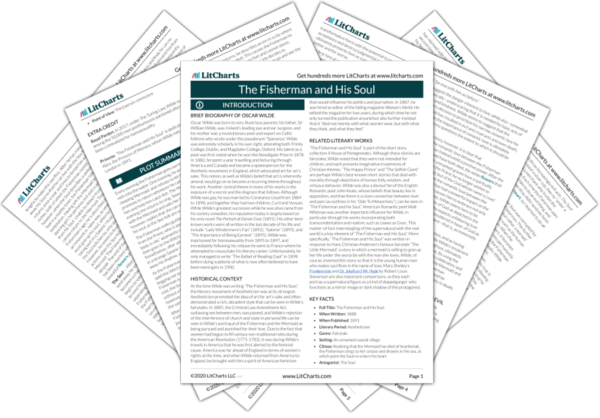 Instant downloads of all 942 LitChart PDFs (including The Fisherman and His Soul). Welcome to the LitCharts study guide on Oscar Wilde's The Fisherman and His Soul. Created by the original team behind SparkNotes, LitCharts are the world's best literature guides. A concise biography of Oscar Wilde plus historical and literary context for The Fisherman and His Soul. A quick-reference summary: The Fisherman and His Soul on a single page. In-depth summary and analysis of every of The Fisherman and His Soul. Visual theme-tracking, too. Explanations, analysis, and visualizations of The Fisherman and His Soul's themes. 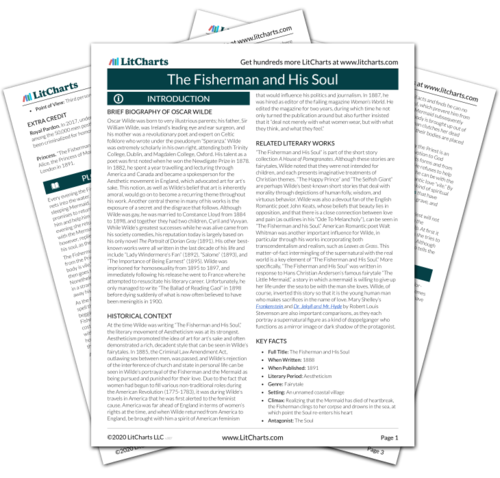 The Fisherman and His Soul's important quotes, sortable by theme, character, or . Description, analysis, and timelines for The Fisherman and His Soul's characters. Explanations of The Fisherman and His Soul's symbols, and tracking of where they appear. An interactive data visualization of The Fisherman and His Soul's plot and themes. Oscar Wilde was born to very illustrious parents; his father, Sir William Wilde, was Ireland’s leading eye and ear surgeon, and his mother was a revolutionary poet and expert on Celtic folklore who wrote under the pseudonym “Speranza.” Wilde was extremely scholarly in his own right, attending both Trinity College, Dublin, and Magdalen College, Oxford. His talent as a poet was first noted when he won the Newdigate Prize in 1878. In 1882, he spent a year travelling and lecturing through America and Canada and became a spokesperson for the Aesthetic movement in England, which advocated art for art’s sake. This notion, as well as Wilde’s belief that art is inherently amoral, would go on to become a recurring theme throughout his work. Another central theme in many of his works is the exposure of a secret and the disgrace that follows. Although Wilde was gay, he was married to Constance Lloyd from 1884 to 1898, and together they had two children, Cyril and Vyvyan. While Wilde’s greatest successes while he was alive came from his society comedies, his reputation today is largely based on his only novel The Portrait of Dorian Gray (1891). His other best-known works were all written in the last decade of his life and include “Lady Windermere’s Fan” (1892), “Salome” (1893), and “The Importance of Being Earnest” (1895). Wilde was imprisoned for homosexuality from 1895 to 1897, and immediately following his release he went to France where he attempted to resuscitate his literary career. Unfortunately, he only managed to write “The Ballad of Reading Gaol” in 1898 before dying suddenly of what is now often believed to have been meningitis in 1900. 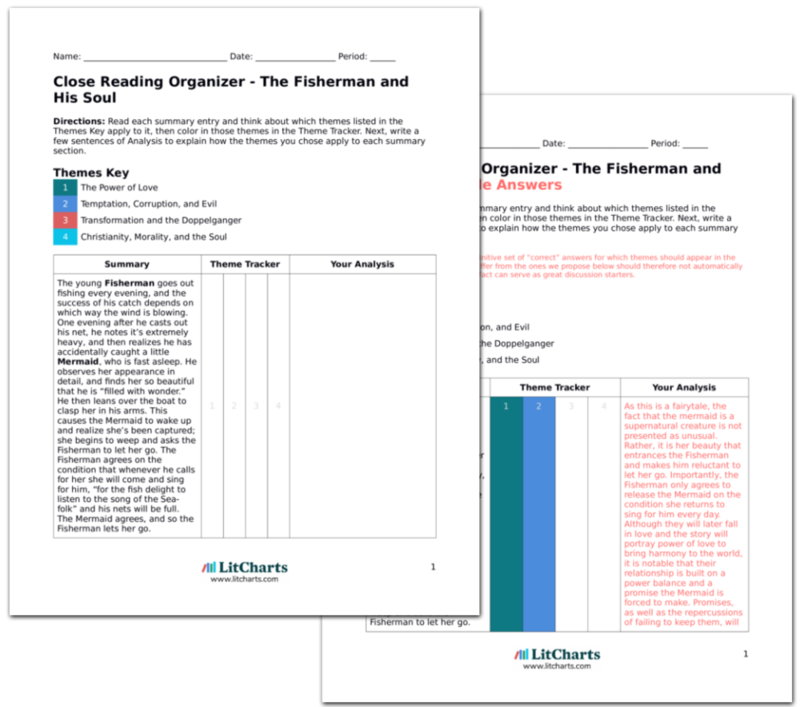 Get the entire The Fisherman and His Soul LitChart as a printable PDF. “The Fisherman and His Soul” is part of the short story collection A House of Pomegranates. Although these stories are fairytales, Wilde noted that they were not intended for children, and each presents imaginative treatments of Christian themes. “The Happy Prince” and “The Selfish Giant” are perhaps Wilde’s best-known short stories that deal with morality through depictions of human folly, wisdom, and virtuous behavior. Wilde was also a devout fan of the English Romantic poet John Keats, whose beliefs that beauty lies in opposition, and that there is a close connection between love and pain (as outlines in his “Ode To Melancholy”), can be seen in “The Fisherman and his Soul.” American Romantic poet Walt Whitman was another important influence for Wilde, in particular through his works incorporating both transcendentalism and realism, such as Leaves as Grass. This matter-of-fact intermingling of the supernatural with the real world is a key element of “The Fisherman and His Soul.” More specifically, “The Fisherman and His Soul” was written in response to Hans Christian Andersen’s famous fairytale “The Little Mermaid,” a story in which a mermaid is willing to give up her life under the sea to be with the man she loves. Wilde, of course, inverted this story so that it is the young human man who makes sacrifices in the name of love. Mary Shelley’s Frankenstein and Dr. Jekyll and Mr. Hyde by Robert Louis Stevenson are also important comparisons, as they each portray a supernatural figure as a kind of doppelganger who functions as a mirror image or dark shadow of the protagonist. Royal Pardon. In 2017, under The Turing Law, Wilde was among the 50,000 men posthumously pardoned after having been criminalized for homosexuality. Princess. “The Fisherman and His Soul” is dedicated to H.S.H. Alice, the Princess of Monaco, whom Wilde met at a dinner in London in 1891. Rainsford, Sue. "The Fisherman and His Soul." LitCharts. LitCharts LLC, 14 Jan 2019. Web. 21 Apr 2019. Rainsford, Sue. "The Fisherman and His Soul." LitCharts LLC, January 14, 2019. Retrieved April 21, 2019. https://www.litcharts.com/lit/the-fisherman-and-his-soul.